Gamebook Adventures 4: Revenant Rising is the fourth in the series of Gamebook Adventures. 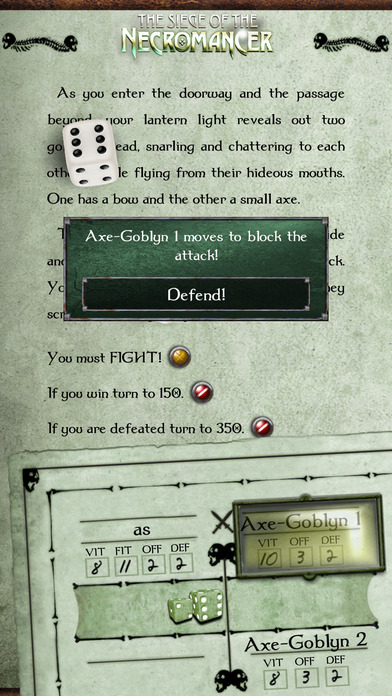 Like the previous instalments, it features dice-roll combat, with a quick-roll feature if you don’t want to wait for animations. There’s also a brand new engine, and all four titles have been updated for iPads as well, and higher resolution artwork for iPhone 4 users. You can check your character sheet throughout the game to see how your stats are going. There are bookmarks to save games, and an interactive world map. Revenant Rising has three difficulty levels: Classic, Bookworm and Novice.